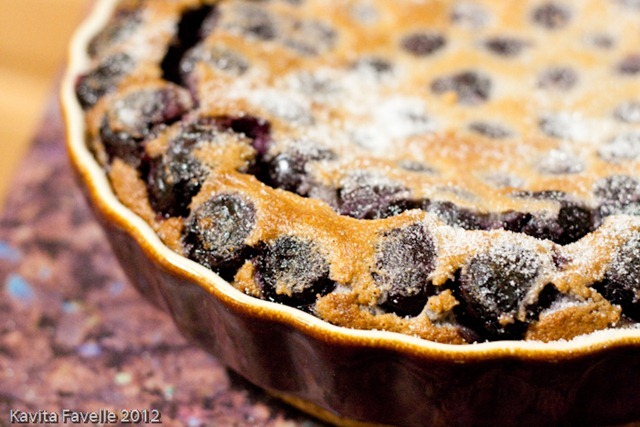 I love black cherries and I love stodgy, comforting puddings, so it’s a wonder I’ve not made clafoutis before now! Clafoutis, for those of you who aren’t familiar with it, is a baked French dessert of black cherries in a thick flan-like batter. 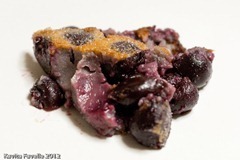 Originating in the Limousin region of France, clafoutis traditionally contains un-pitted black cherries, as the pits release additional flavour during cooking. However, these days, recipes for versions using pitted fresh cherries, and even tinned cherries, abound. 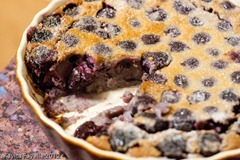 A similar dessert can be made using many other fruits, from plums and prunes to apples, blackberries and even physalis, though such versions are correctly called flaugnarde, rather than clafoutis. 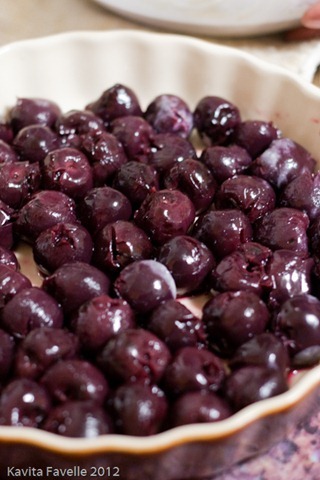 As I didn’t fancy spending an afternoon pitting cherries, I decided to use tinned black cherries, choosing the kind that are preserved in syrup. 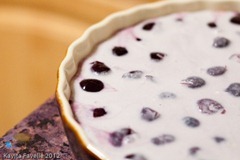 I created this recipe by combining elements of several different recipes I found on the web. Drain the tinned cherries into a bowl, reserving the syrup. 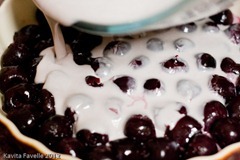 Pour 50 ml of the reserved syrup and 50 ml of your chosen alcohol over the cherries and leave to macerate in the fridge for a couple of hours. 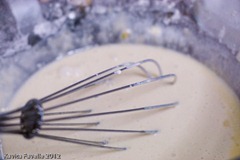 Grease a flan dish with butter and sprinkle with sugar, shaking to distribute the sugar evenly over the butter. Tip out any excess. Heat the butter gently in a small pan until it turns a very pale brown, known as beurre noisette or hazelnut butter, after its colour. Take care not to let the butter burn, or it will taste bitter. 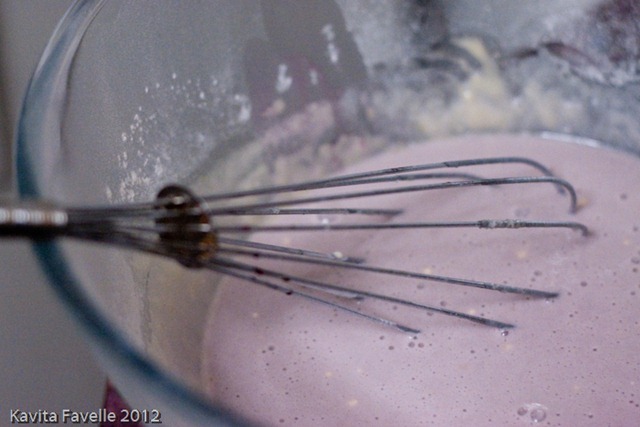 In a large bowl, whisk the sugar, eggs and vanilla until well combined. Add the flour and whisk until there are no lumps remaining, then slowly add the milk, cream, salt and browned butter. 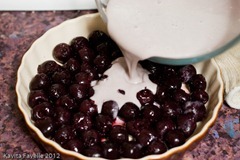 Retrieve the cherries and carefully pour the alcoholic juices into the batter, and mix in. 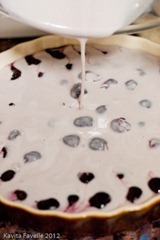 Tip the cherries into the flan dish and spread them out evenly, then pour the batter over them gently. Bake in the oven for 30-40 minutes, until the top is golden brown and a knife or skewer inserted into the middle comes out clean. 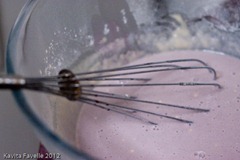 To finish, sprinkle with caster sugar and serve warm. I served mine with ready-made chocolate custard, for a black forest gateaux flavour combination. You can see from my photographs that my clafoutis stuck to the dish! That’s because I completely forgot to grease and sugar the flan dish, despite writing it down in my recipe plan. It should come out more cleanly, if you make sure you include that step. 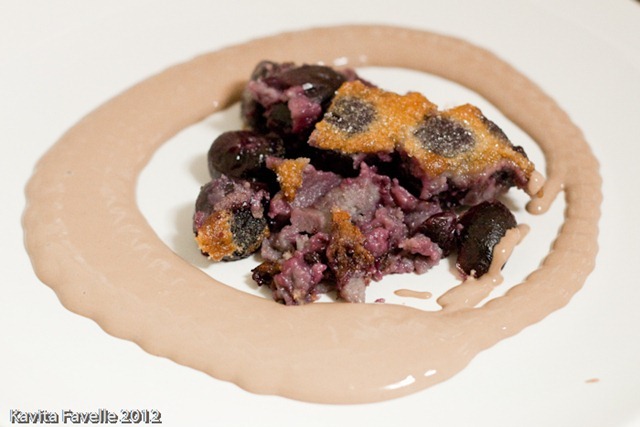 16 Comments to "Clafoutis: A Black Cherry Pudding"
Wow. Looks very pretty. 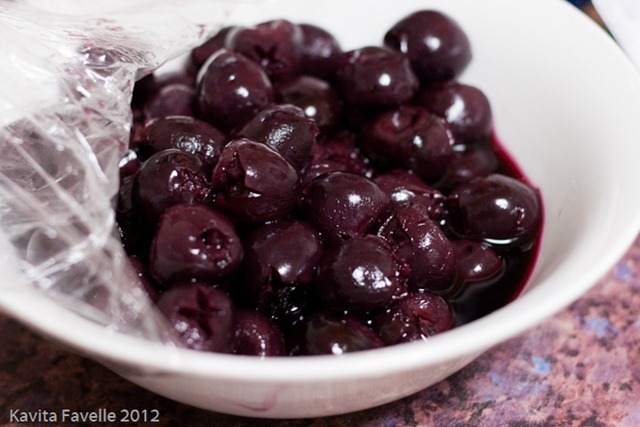 I picked a huge bowl of cherries last year from the trees on our lane and then carefully pitted them all. Took me ages. I then made a clafouti but I didn’t like it!! Tasted too custardy for me. Even though yours does look so beautiful !! Yes it’s essentially a thick custard batter, very stodgy and gently flavoured… I loved it but I can see why not everyone would! 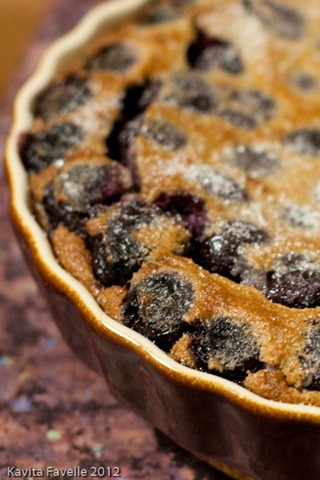 It looks gorgeous – I’ve never made a clafoutis either but I know it’s something I’d love. that’s a lovely lovely photo kavey! unlike dom, I really love custard, and all its variants, including savoury non-pudding ones like chawanmushi, and my mum’s steamed eggs. Very interesting to hear how this was traditionally made using unpitted cherries, haha it would be quite an amusing scene at the table with all the diners spitting out cherries while they delicately tucked into their dessert. cherries and chocolate. What’s a super pudding, Kavey. Oh I love it! It looks so delicious and just bursting with flavour. 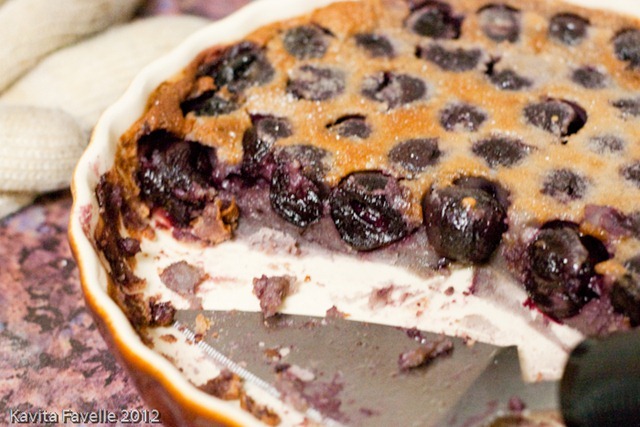 I do love a Clafoutis- when we were away last year for two weeks in France, every night I made one of these from the cherries from the tree in the Orchard! Some lovely (and delicious) memories have just come flooding back! I make it with fresh cherries without stoning them – it’s easy enough to remove the stones as you eat! Shuhan, yes that’s the traditional recipe, the stones add more flavour too. Elly, I love cherries, so it had to be cherries for me! Gill, Kathryn, thank you both! Kate, I’d love to have a cherry tree, and have access to a bounty of fresh fruit! Jeanne, shall go and look! Sarah, that’s the traditional way, but stones aren’t for everyone, though I don’t mind them myself, the husband wouldn’t be as keen, and I cooked this on the same night as the beef bourgignon, as a bit of a feast! How can you not like custard? 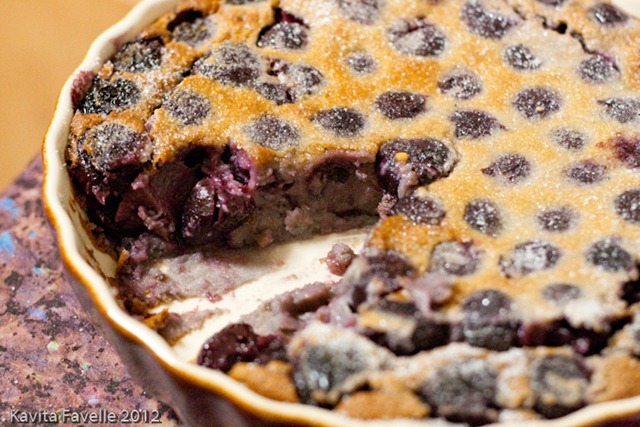 !..mmmm Clafoutis. My favourite is with blueberries, orange and lemon zest. I love clafoutis though it’s always hit and miss as to whether I can make a good one or not – yours looks gorgeous.